Business as usual is not an option, if we want to reduce hunger and poverty, improve rural livelihoods and achieve environmentally, socially and economically sustainable development for all. This was the message of the “International Assessment of Agricultural Knowledge, Science and Technology for Development” (IAASTD). 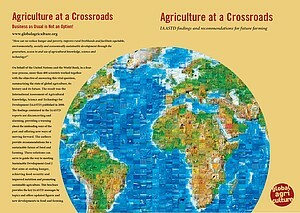 The new brochure “Agriculture at a Crossroads” presents the report’s main findings with updated facts and figures, charts and maps and the latest scientific insights. The 52-page-brochure covers topics such as hunger and health, meat and animal feed, industrial and small-scale farming, climate and energy, agroecology, soil fertility and land grabbing. It connects the IAASTD’s findings to the UN Sustainable Development Goals (SDGs) and contains an interview with IAASTD co-chair Hans Herren. You can also order Issues in Brief (€4), a set of English or Spanish summaries of the main IAASTD topics such as Multifunctionality or Trade and Markets, and the official Synthesis Report (€15).